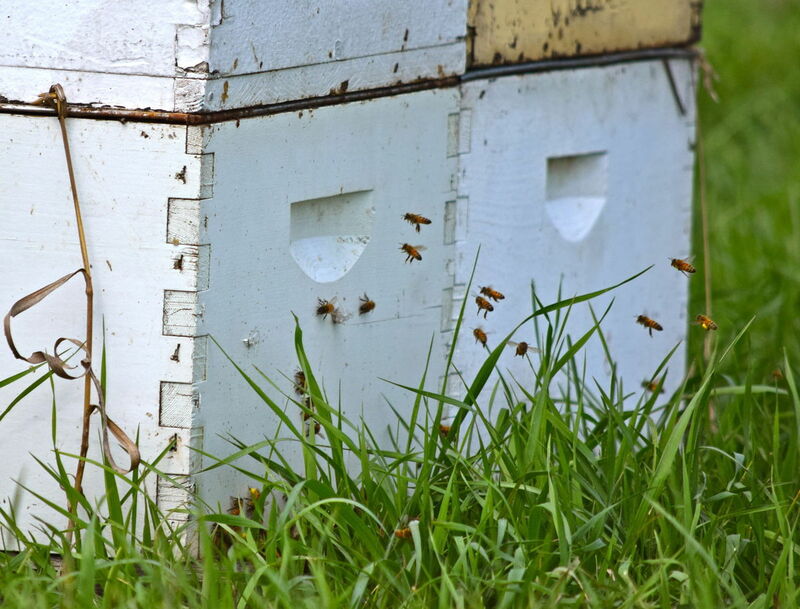 CATCH THE BUZZ – This Program Offers An Opportunity For A Beekeeper And A Farmer Or Rancher To Open Up A Dialogue About Sustainability And Stewardship In The Agriculture Community. Bees buzz around boxes Sunday near Coleharbor. Kasey Bitz has long had an interest in honey bees and was excited to learn his home state was the national leader in honey production. “I want to do something (to help),” he thought, after moving back to the family farm in 2013. When the young Lamoure farmer came across the Bee Integrated project at the Commodity Classic, a farmer convention and trade show, he gladly signed up a portion of his land and become one of three North Dakota farmers to partner with a beekeeper on the pilot project to improve the health of bees and other pollinators. 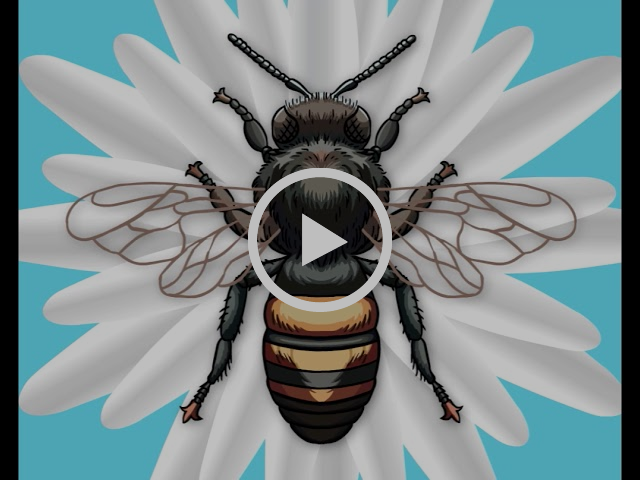 The honey bee contributes its pollinating powers to a third of the country’s food supply but pollinator populations are declining due to a number of stressors – loss of habitat, pests and exposure to chemicals. In 2016, eight percent of kept bees disappeared, according to the American Beekeepers Federation, and between 2015 and 2016 there was a 44 percent decrease in colonies. Bee Integrated is an experiment aimed at better implementing the best practices of both beekeeping and farming in unison, improving beekeeper and farmer relations, and then measuring to see if the implementation of these best practices are making a difference. “It’s communication more than anything,” Bitz said, and mostly easy changes to how he operates on the farm, like being more conscientious of when he chooses to plant in order to keep the seed’s fertilizer coating from drifting into the air. Borrowing a line from one of the beekeepers who helped found the project, Zac Browning of Browning’s Honey Co., Smith said beekeepers, “used to come to North Dakota because it had the best bee habitat in the country where beekeepers could build up their colonies’ populations before moving on to fulfill pollination contracts.” With the conversion of more land from bee friendly crops, like alfalfa, to more profitable row crops, like corn and soybeans, North Dakota has become only the least worst place for beekeepers to summer their bees. This is the first time Bitz has had bees on his farm. He’s working with Browning, converting 40 acres from cropland to a honeybee and butterfly plant mix, mostly flowering plants like sweet clover and alfalfa, he said. “I might have planted soybeans there (in a normal year) but I didn’t know what the market would do,” Bitz said. Instead, for the next three years, Bitz will receive seed and rental payments for the pollinator habitat. Smith said project field staff worked with the farmers to pick land that made the most sense for planting the pollinator mix – land where production isn’t as good and where most years farmers only harvest a yield large enough to break even financially or suffer losses. He said the project then puts that land to better use and gives the farmer cash in their pocket on previously unproductive land. The funding for the seed and payments to farmers comes from the Bee and Butterfly Habitat Fund, a non-profit organization. Smith said they aren’t trying to replace federal programs, like the U.S. Department of Agriculture’s Conservation Reserve Program, but for this experiment, the Bee and Butterfly Habitat Fund was easier to enroll in quickly. As part of the experiment, the participating beekeepers house a number of their colonies on the best practices acres and continue with their normal practices on another set of colonies that act as the control group for the scientists to measure progress against. They’re testing the pollen that the bees bring back from the field to see what they’re foraging on. Randy Verhoek, owner of Harvest Honey Company near Baldwin, heard about Bee Integrated from Zac Browning and also signed up his bees. “What I like most about the program is it opens up an opportunity for a beekeeper and a farmer or rancher to open up a dialogue about sustainability and stewardship in the agriculture community. There are so many challenges to keeping bees and farming successfully. Thus, if we can talk about each other’s challenges, we come away with a better understanding of each other’s operations,” Verhoek said. Part of Bee Integrated is a job swap between beekeepers and farmers to give both sides a better idea of the others daily operation and challenges, Smith said, giving each side a firsthand understanding. Bitz said he’s gotten to put on a bee suit to see varroa mite testing and got to taste the honey straight from the hive. Verhoek shared with his farmer partner that his biggest challenges are keeping healthy queen bees. Verhoek said he is confident the project results could be implemented long term and widely spread, but funding will be the challenge. “It will take a tremendous amount of funding to expand the program to really make a big impact on a large scale basis,” he said, and he’s calling for buy in from the agricultural and non-agricultural communities alike. Previous articleCATCH THE BUZZ – OHB’s Breeds 180,000 European, Carniolan, And Saskatraz Queens Every Year, And 100,000 More At Their Hawaii Operation.